Thoughts in a Haystack: What Do These Posts Share In Common? What Do These Posts Share In Common? How about that they can be opposed to one another for the staging of a middle ground fallacy? Since I never said that they were equal (I asked for similarities) that's not what I was thinking about but thanks for playing. Both claim the mantle of the victim? BTW, Coyne's civil rghts arguement bugs me: I don't recall African Americans demanding that people become black, or homosexuals insisting people become gay. I don't believe I have to be tolorant of intolorance. Yes, that's two of them: They both claim that they are being "discriminated" against because they are criticizied (fairly or not) and compare themselves to those who have suffered racial or gender discrimination, not because they have suffered (legitimate) economic or social harm, but simply because not everyone they consider to be important (for whatever reason) agrees with them and/or will take them seriously. There is (at least) one more similarity. ... and I suppose the peas in a pod image was just an encouragement that we eat our vegetables? Point being, without even referencing gays & homosexuals, you could just as easily add passages from our Declaration of Independence or Thomas Paine's Age of Reason to your post. The one spoke of oppression, the other was abrasive. Which is to say, they bear characteristics similar to those you are pointing out, and yet it doesn't translate into a comment on the character of the work itself (which is what matters). So it's like pointing out how impressively large that molehill next to Mt. McKinley is. Are there any prominent atheists who say they have experienced economic/social hardship of a kind comparable to gays & black people's hardships? Any of the "four horsemen" maybe? I'm not sure that any such expressions have been made that could be considered representative. There is indeed one meaningful respect in which they are equal: the same essential critique against new atheists was made against Tommie Smith & John Carlos, the two black-gloved fist-pumping runners in the 1968 olympics. The olympics, everyone said, was "not the place" for a political expression like that. And they were attacked for being "angrier, nastier, uglier". That is, not for the merits of their position but for the atmospheric complaints of personal behavior. It's not that the critics were intolerant of black people, of course not! They just suddenly became obsessed with enforcing unstated conventions for proper conduct. And doing so in such a way as to completely marginalize them. Of course, deprived of the old institutions that might allow people suppress & marginalize, the enforcement of unstated societal norms becomes a vessel for expression of the same bigotry. This isn't to say militant atheists don't exist, only that the examples, such as they are, are leveraged for all they are worth to make arguments over atmospheric complaints about behavior. That conveys an interest in the debate only up to the point that opportunities are presented for attacking atheists, and a basic lack of seriousness for anything beyond that. If all they were doing is fighting for equal rights, and/or redress for past oppressions your arguement would be correct and the criticism would be unjustified. But that's not what their stated goal is and ignoring that in judging their actions is incorrect. Their goal is to get rid of religion, or at least relegate it to the province of a small, fringe movement. That goes beyond equality and so just because they say they're simply using the same tactics as other civil rights groups doesn't mean they're justified in using them. And that's a point that they should be called out in. Without that justification, their tactics are just a mess. Without doing a full blown exegesis on my selection of accompanying photographs, which are often tongue-in-cheek visual "punes" (as Wilkins calls word play), the peas in a pod trope is often used to describe superficial similarities. Are you really going to compare the political oppression that Thomas Jefferson and Thomas Paine were complaining of to "New Atheists" (I'm guessing you're not including Casey and the IDers here) being called "violent or strident"? Should I add an overblown sense of self to my list of similarities? And no, the New Atheists can't credibly say that they've experienced economic and social hardship of a kind comparable to gays and black people (or even American colonists), which is why the comparison, endorsed by Coyne, of Ruse's criticism (fair or not) to blacks being called "uppity" is so inappropriate. That word was used to describe blacks who were trying to "rise above their station," which was defined by their economic and social oppression and the word was a tool in maintaining that oppression. That's also why your "example" of Tommie Smith and John Carlos fails. They were protesting long-standing economic and social oppression. They were not protesting having some nasty things said about them by a professor of philosophy during a political debate. As to trying to "marginalize" New Atheists, that's what political debate is all about -- trying to marginalize your opponent, at the polls or in society at large, by getting your own position accepted by the majority. Breaking out the "discrimination" card every time some opponent says something bad about you, when it is unaccompanied by actual oppression, is more than a little ludicrous. And as to the complaint that political discourse is sometimes shallow, all I can say is ... Really? I never knew that! Of course, we've never seen any New Atheists make a shallow argument ... if you don't count the discrimination crying towel -- and one or two others -- I suppose. There's still one more similarity on my list but is no one gets it by tonight I'll just have to reveal it myself. They both seek to overturn seperation of church and state in this country to allow for their own definition of science - one would "prove" there is a god while the other would "prove" there is none. And neither realizes that allowing one through the door would also allow in the other. Not on my list, which is more superficial than the underlying aims of the two groups and has to do with behavior in debate. Nor do I think that the New Atheists want to formally overturn the separation of church and state (which most of the IDers would love to do). The NAs want to reduce religion to irrelevancy, mostly by argument rather than with the assistance of government, though they sometimes tread the line, as in the case of the blindness of some NAs to what was wrong in what James Corbett said in class. I guess I was thinking that one group intentionally wants to do that but the other group aims would unintentionally do that. Same result though. Both complain about being called names while calling their opponents names ... Casey: "anti-evolutionist" vs. "materialist neo-Darwinian" (i.e. "Darwinist"); Coyne: "violent or strident" vs. "faitheist". Hmm I don't recall Coyne demanding religious people to become atheists? You think Coyne that defending oneself against lies, as those spread by Ruse is claiming the mantle of the victim? Since he is the victim of smearing, how is that wrong? Defend away! I'm not saying Coyne or anyone else shouldn't. But defend with arguements (the NAs are claiming to be the rational, logical side) not by phoney emotional appeals to "discrimination." And, no, I don't think being called a name makes you a "victim" ... or else who is more a victim than creationoists and IDers? Defending yourself by adopting your opponents tactics raises the question of whether there is really much to choose between you. Woah! Enough words were put in my mouth that I could have been choked to death. I'm going to kindly insist you re-read my comment at 3:21. Are you really going to compare the political oppression that Thomas Jefferson and Thomas Paine were complaining of to "New Atheists" (I'm guessing you're not including Casey and the IDers here) being called "violent or strident"? I am in fact including them. Which should make clear that I am not equating them as equally oppressed, but that each similarly in involved a claim of oppression. It's a similarity in kind, not degree. That's also why your "example" of Tommie Smith and John Carlos fails. They were protesting long-standing economic and social oppression. They were not protesting having some nasty things said about them by a professor of philosophy during a political debate. You swing, you miss. My example wasn't to compare the issue they were fighting for, nor was it to compare the degree of hardship. I was highlighting the fact that their critics called them abrasive and nasty. As to trying to "marginalize" New Atheists, that's what political debate is all about -- trying to marginalize your opponent, at the polls or in society at large, by getting your own position accepted by the majority. I'll grant that you might have misread me above, but there is no excuse for this. You know know very well that marginalization isn't synonymous with intellectually honest engagement. My whole comment was about the kind of marginalization motivated by bigotry. ...not by phoney emotional appeals to "discrimination." I'm an atheist because I put stock in the arguments for atheism. My observation that people call atheists abrasive has nothing to do with why I'm an atheist, and I never suggested it did. I understand it's a useful survival skill to assume ignorance on the part of faceless internet commenters, but yikes! Their goal is to get rid of religion, or at least relegate it to the province of a small, fringe movement. That goes beyond equality and so just because they say they're simply using the same tactics as other civil rights groups doesn't mean they're justified in using them. They are putting forward arguments. They aren't asking for peoples voting rights or citizenship or right to expression to be taken away. That atheists think everyone should be atheists is no different than Republicans thinking everyone should be more like Republicans. The fact that atheists are trying to open up a public debate wherein people might freely choose to subscribe to atheist ideas is not inconsistent with equality, it's an affirmation of it. I was highlighting the fact that their critics called them abrasive and nasty. So what? Leona Helmsley was called abrasive and nasty. Should anyone have taken her seriously if she had started whining that it was the same as calling her "uppity"? You know know very well that marginalization isn't synonymous with intellectually honest engagement. My whole comment was about the kind of marginalization motivated by bigotry. But you admit that atheists haven't suffered bigotry so how is it "intellectually honest" to start comparing atheists to those who have suffered bigotry or comparing critics of atheists to critics of Smith and Carlos who were intolerant of black people or to claim that they are practicing the "same bigotry"? If you want to say Ruse is being intellectually dishonest, say so and, better yet, demonstrate it. Don't try to put on the mantle of those who have faced real bigotry. My observation that people call atheists abrasive has nothing to do with why I'm an atheist, and I never suggested it did. I didn't assume it did. 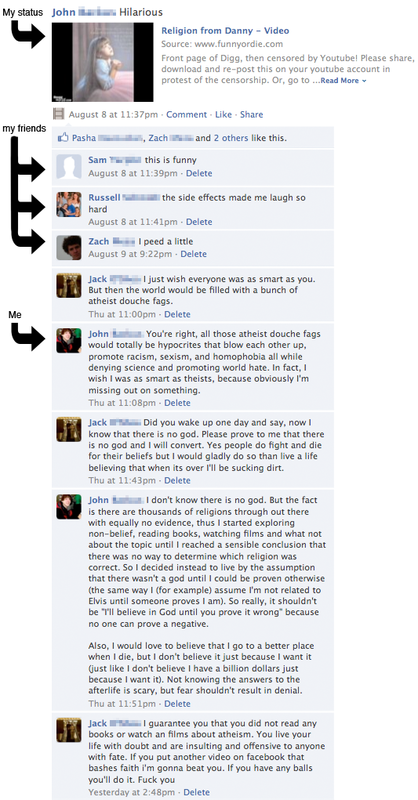 What I was pointing out was the method some atheists have adopted in the debate. My point was that the whole "uppity" business is orthogonal to that debate. If you want to charge Ruse with intellectual dishonesty for an ad hominem attack or whatever, also fine. But don't then commit one right back by implying that Ruse is engaged in an expression of the same bigotry that people who used the word "uppity" were. that is such a passive description of what NAs are doing that I reject it out of hand. It simply doesn't reflect the reality I've personally observed, read and experienced. You yourself tried to evoke the imagery of the civil rights movement and, when called on it, you backpedaled. You may argue that you've later qualified that example, but If John hadn't called you out on it your statement would have remained undefined. That's a debate tactic, and that's what John quite rightly is criticizing. You mention the method, I wonder if the problem with the method can be found in the chosen goal? I do believe there is a problem with public perception of atheism - polls show that an atheist would be the last or near the last kind of person people would vote for public office. But I think NAs are confusing that problem with the problems that arise from religious beliefs. In that respect, is the criticism that their strategy is just a mess? On the one hand, they seek respect in the public marketplace but on the other some do so by trying to tear down their perceived enemy - religion. If they were simply advocating for equality in society that would be one thing, and perhaps some imagery of civil rights would be warrented. But equality is not the goal. I quote from the Reason Project's front page: "erode the influence of dogmatism, superstition, and bigotry in our world." And, of course, there's evidence in their discourse that shows that consider pretty much all religious beliefs to be covered by that statement. So although there may be desire for some kind of civil rights movement for atheists, they're not looking for equal opportunity - they're seeking dominence in the public marketplace. I guess in that way josef is accurate - they want more atheists in the same way republicans want more republicans. Seeing as how dishonestly the republicans have been framing issues, it's a pretty apt description. As far as their aims, as long as they are legal, atheists are entitled to them. If I wanted to argue that those aims are bad for society, I'd address those issues without the need to discuss the tenor of their debating style. The method of debate is more relevant to their strategy but again they're entitled to it. Of course, if their strategy is bad, those who oppose their aims should be happy. Seeing as how dishonestly the republicans have been framing issues, it's a pretty apt description. I'm not sure on what universe you have to live to call it "passive" to point out that they aren't in fact trying to make religious people second-class citizens. It's certainly not reality. Tell me, what is one thing atheists have done besides try to debate? Hello? Did you read any of that? That was before anyone had responded to me. Go on, tell me in your own words. What did I mean by the above? If I was "backtracking" how did I manage to type that before any responses appeared? Stop putting a straw man in front of me and demonstrate you are at least minimally conscious of the point I am making. Huh. I thought you might decide to go with Ted Kazinsky or Charlie Manson. Hey, why not Stalin? 100% false. It's cute that I am forced to choose between an all-out equating of atheists with blacks, or that they haven't suffered any form of bigotry at all. They (1) have been criticized for having abrasive behavior by groups intolerant of them. And (2) they haven't experienced the same social economic hardships. Those aren't contradictory positions (go ahead, glaze over this). You are trying with all your might to blend those two together and convict me of equating them. What dishonest garbage. I could just have easily replaced Republican with Libertarian, Catholic, or Capitalist and the point would have been exactly the same. All of those groups are opposed to certain ideas. That doesn't mean they don't believe in equality. I can't believe I even have to point this out. "Of course, deprived of the old institutions that might allow people suppress & marginalize, the enforcement of unstated societal norms becomes a vessel for expression of the same bigotry." "My example wasn't to compare the issue they were fighting for, nor was it to compare the degree of hardship. I was highlighting the fact that their critics called them abrasive and nasty." "So what? Leona Helmsley was called abrasive and nasty. Should anyone have taken her seriously if she had started whining that it was the same as calling her "uppity"?" "The point is that society at large is not yet welcoming to atheists even though they are ostensibly equals whose ideas are supposed to be engaged with on the merits." Which isn't the same as the poll results I mentioned first (you're welcome) and which you then linked to. I think John was on to something when he asked "Should I add an overblown sense of self to my list of similarities?" I guess I'm seeing this as more evidence that the tactics of NAs are a mess because their goals are confused. Is the goal to have attitudes toward atheists changed so that they have equal opportunity to be president? I have no problem with that and would in fact support a qualified candidate. And as 45 percent of would, that obviously includes quite a few religious believers. Or, is the goal to "erode the influence of dogmatism, superstition, and bigotry in our world," (from the Reason Project's front page) with that statement including religion and religious believers? In other words, promote tolerance, fight intolerance and seek equal opportunity for all - something, according to that poll, is very close to coming true? Or justify intolerance toward people who are not respected? I wonder, how do you do that and hold onto the portion of believers who help you get to 45% in the first place? "I could just have easily replaced Republican with Libertarian, Catholic, or Capitalist..."
Because I was choosing an example similar in seriousness to the atheists' complaint in this case. It's cute that I am forced to choose between an all-out equating of atheists with blacks, or that they haven't suffered any form of bigotry at all. No, you only have to express yourself cogently. They (1) have been criticized for having abrasive behavior by groups intolerant of them. So Ruse is "intolerant" of "New Atheists"? On what evidence do you base that? The fact that he disagrees with them? It can't be because he calls them "abrasive" -- that would be circular. And (2) they haven't experienced the same social economic hardships. Those aren't contradictory positions (go ahead, glaze over this). I don't need to. The question has always been the aptness of associating NAs with the type of oppression that blacks have suffered. There are many other examples of rhetoric that nominally serves "the same function as calling an african-american 'uppity'". For example, there is Larry Moran calling ID proponents "IDiots." There are lots of instances of harsh rhetoric (something that NAs, if anything, revel in when they're dishing it out) that is intended to make the hearer think less of the speaker's opponents. "Abrasive" (as the Helmsley example indicates) is not close to achieving the status of a "code word" for any one group in the way "uppity" did. Why chose "uppity" as an example if not to make the hearer, consciously or unconsciously, feel sorry for the oppressed NAs? Comparing the two is not apt unless there is something more to connect the treatment of NAs to the treatment of blacks. The point is that society at large is not yet welcoming to atheists even though they are ostensibly equals whose ideas are supposed to be engaged with on the merits. Since they aren't allowed to be dismissed as sub-human, their critics become incredibly sensitive to how ill-behaved they supposedly are. Again, that depends on Ruse actually being biased against NAs (or cynically playing to the biases of the majority). Do you have any evidence of that, as opposed to his honestly (even if wrongly) thinking NAs are abrasive? Surely you're not saying he should "censor himself" because a majority of people might take him incorrectly, are you? And, yes, the majority of people in this country don't trust atheists enough to vote for them (at least in the abstract -- few politicians have tested whether it will apply in practice) and most people think there is something wrong with atheists because they are (as far as they know) aliens to their lives and communities -- the very definition of "the other." I have applauded the NAs for helping to start to change that, even if I don't always agree with them. It is still a far cry from what blacks have suffered and if you're going to compare the rhetoric against NAs to that used against blacks, you're going to have to show that the person actually using the rhetoric is biased, not just that there is bias "in the air." I've opted not to dignify your latest comment with a response. When you come up with an example of some way atheists are going "beyond equality" perhaps I'll get back to you. Let's let a few things sink in. For the past 5 or so comments, you've been arguing against a fictional entity. You thought, mistakenly, that I was comparing the hardship suffered by atheists to that of revolutionaries and blacks. You thought, mistakenly, that I said atheists had not suffered the effects of bigotry. You erroneously advised me of the valid functions of marginalization. Back in reality, I've been trying to get your attention, with no luck. If you thought I wasn't cogent, perhaps you should have asked me to clarify rather than use the perceived ambiguities to manufacture a straw man. I would have been happy to see you were making a good faith effort at interpretation. That's true, and it sometimes damages the quality of discussion, sometimes is useful because the targets are deserving of scorn. But for what it's worth it exists in tandem with a plethora of substantive, detailed arguments- the last thing NAs are is afraid of detailed discussion. And they aren't unfamiliar with religious people or religious society, so it would be mistaken to suggest that NA's insult because they are motivated by the same kind of insecurity as their critics. For every one John Lennox criticizing Richard Dawkins, you have perhaps two dozen public commentators who accuse Dawkins of being militant but not engaging substantively with him. God knows how much worse the ratio is in the public at large. This minority position is a respect in which NA's are more like black people & homosexuals than they are like their critics. Though I do think comparing Luskin to Coyne isn't useful for much other than staging a middle ground fallacy, I can't say that Ruse is intolerant based just on his article. Ruse doesn't appear to be guilty of anything more than ad hominems and bad arguments, whether he is literally intolerant, I can't tell one way or another without knowing more about him. But something like this, to me, would count as a clear cut instance of exactly the kind of intolerance I'm talking about. And the Freeper forums should provide sufficient examples to illustrate that it's not a one-off thing. Together with the poll I've linked to and a number of personal experiences (the latest coming today in fact, when I met a crazy inlaw who said christians are "by definition" morally better people), I think there is a reasonable basis for a generalization about a non-trivial portion of society. Comparing the two is not apt unless there is something more to connect the treatment of NAs to the treatment of blacks. The criticisms against atheists are similar in a number of other respects (being "the other", the specific reference to personality defects, and the lack of morality to throw a new one in there), that it feels arbitrary to me that something like a specific code-word should be the tipping point. I don't know of any code-word, and the comparison still seems to me sufficiently illustrative. This is becoming too time consuming for me, so this is my last comment (unless TB provides that sorely lacking example I'm waiting for). In any case I'll be reading the subsequent comments. I was discussing the post by Coyne and your comparison to Carlos and Smith. I know you're not claiming that atheists suffered the same hardship. The question is why, as a matter of debate, Coyne and you are using those examples. I read your words. I can't read your mind. I haven't a clue what you're talking about. I observed that "marginalization" of opponents (as I defined it) is an aim of all political debate. ... it would be mistaken to suggest that NA's insult because they are motivated by the same kind of insecurity as their critics. Heh. So now you're claiming it's all right to employ the same sort of debate tactics that IDers do because you're right? For every one John Lennox criticizing Richard Dawkins, you have perhaps two dozen public commentators who accuse Dawkins of being militant but not engaging substantively with him. And now you're claiming that you don't have to engage the arguments of the person you're responding to ... you can respond instead to what you perceive someone "out there" may be thinking? ... it feels arbitrary to me that something like a specific code-word should be the tipping point. Then why make a comparison (in Coyne's case) to a specific code-word? That was the point of the original post ... which had nothing to do with a middle ground fallacy (which I don't think applies in this case unless you commit the fallacy of the excluded middle but that's a whole 'nother argument). If it's any comfort, the Carlos/Smith comparison (after being explained at length, as you finally have after several tries, and not dropped into a debate the way Coyne did with "uppity") is not as egregious as Coyne's usage of "uppity," as long as it is used against someone who you can tell is intolerant. I still think it is a more honest debate tactic to explain the underlying logic of why you think accusing NAs of being abrasive and nasty is misdirected and to leave out the Carlos/Smith example altogether or find a less emotionally charged example but, under the circumstances detailed, I would not have compared such an argument to Luskin's. "It has also obliged us to lie to ourselves — repeatedly and at the highest levels — about the compatibility between religious faith and scientific rationality." I think it's pretty clear that - through any legal means - the ultimate goal is to end religious belief. I suppose, in a twisted way, once that occurs there will be equality, But then there doesn't seem to be an awful lot of tolerance. Sure, there are fundamentalists who deserve scorn, but in denying any possibility of science/faith compatability at any level that lumps a whole bunch of people in with the fundamentalists. Many of whom are probably among those 45% who would vote for an atheist for president. And here's the thing: I have a hard time believing you weren't aware of this, and so don't believe you're arguing -ahem - in good faith. John Pieret: "Both complain about being called names while calling their opponents names ... Casey: 'anti-evolutionist' vs. "materialist neo-Darwinian" (i.e. 'Darwinist'); Coyne: 'violent or strident' vs. 'faitheist'." Blackford and Benson have gotten into the hypocrisy, too, and the latter especially has complained that M&K are using metaphors of violence by describing the "New Atheists" as attacking or assaulting their opposition. Where were they when PZ Myers was going on about rhetorical brass knuckles? Having checked out that link and looked at your site, I have to say I admire your tone and approach. Well done. Yeah, I saw that and thought about jumping in early on but hesitated (it was late and I really do like Russell and don't feel comfortable applying the "harsh criticism" to him that so many NAs like to dish out but start whining about as soon as it comes their way). When I went back later, the comments had already multiplied to the point I just didn't have time to absorb them all. I felt guilty though leaving you to take the brunt. I see there have been mentions of "concern trolling," which is ironic since wasn't that the whole basis of Russell's "distinction" between individuals and a private organization with (as you said) a limited mission (government organizations and organizations with multiple missions -- like the NAS -- are at least potentially different animals) ... "we wouldn't want you to get hurt by losing the people who might otherwise support you financially and support your mission." And isn't that pretty much the reason that M&K give to suggest that NAs tone down the rhetoric? "We don't want the public to ignore your advice and cut your funding"? Still, I cannot fathom what distinction he thinks he's making between improper suggestions of "self-censorship" and what they are telling the NCSE.